Why Choose Ceramic Wedding Bands? While we all had our own favorite colors when we were children, even today most of us might have some tones and tints that we prefer, and all of us will have particular colors that we associate with certain things. Whatever your thoughts when it comes to wedding bands, it is time to throw them in the trash and seek out a new approach. Forget about the traditional gold, or even the ‘whitening’ of wedding bands owing to metals such as silver, platinum, and the controversial white gold. Today, every color you can think of is available to wear as a wedding band. This is especially true with ceramic wedding bands. Ceramics are seen as great materials to have either individually as a ring, or within a two-tone ring alongside tungsten carbide. Why would you use ceramics for your wedding band when there is a huge range of traditional metals to choose from? The biggest benefit of ceramics is that you can truly have your wedding band any color you want it to be. They hold an advantage because ceramics are produced in the color that the ring will be; it is not a coating of a material, as you might find when other materials or metals are used to create a wedding band. An additional benefit is that in terms of scratch resistance and durability, ceramics scores almost as highly as tungsten carbide. Now, you have the wedding band you want and a color that you know is going to last, and will not need maintaining or touching up during its lifetime. The benefits do not stop there, either. 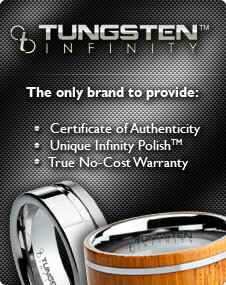 Ceramics are well known for their lightweight nature, a trait shared with another emerging wedding band metal, titanium. This makes it the perfect wedding band solution for both men and for women who want to wear their ring without feeling as if their finger or hand is being weighed down. Finally, the sheer range of options available when it comes to ceramic rings mean they are definitely a choice worth considering. Whether you are looking for a standalone ceramic ring, something with a precious stone set within it, a two-tone tungsten carbide wedding band, or something else, there is a wide choice so you are assured of finding a product to match your individual tastes and style.